I cut my teeth on Ellery Queen. I believe it was his “Challenge to the Reader” that really captured my attention. The sheer audacity of an author saying, essentially, “OK, now you know everything that I know and everything that you need to solve this mystery. So, go for it.” (Pardon the 21st-century language.) That was simply fuel for my fire. And go for it, I did. Of course, I never solved a single one. Oh, I might have guessed one or two, but I never was able to follow, exactly, Queen’s logic. 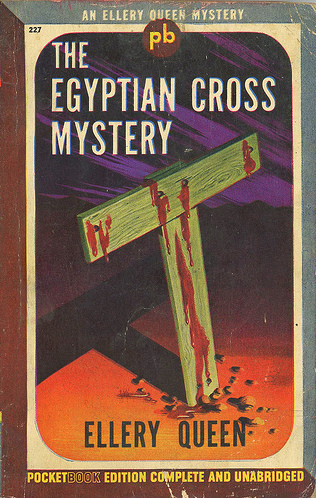 Of all of Queen’s many novels, the one that comes to mind immediately is The Egyptian Cross Mystery. It’s one of the early ones, published in 1932. It was also the first of the Queen novels that found Ellery investigating independently of his policeman father, Inspector Richard Queen, and doing so outside the environs of New York City. And, for 1932, the tale had some interesting features, including a nudist cult and ancient symbols--elements of sensationalism that are still popular today. In brief, and without giving away too much of the story, a man is murdered in a small Virginia village. He is found headless, crucified on a kind of totem, at a crossroads. It turns out that the murdered man is the local schoolteacher, who had come from a larger city. He had no real intimate friends in the village, and Ellery is unable to find enough evidence to name a culprit, though the appearance of a strange old man who leads some kind of cult that mixes Egyptology and nudism adds spice to the investigation. So, the great detective retreats to New York City. Then, a few months later, an old professor of Ellery’s calls him. A second, similar murder has been committed in the professor’s neighborhood in New York. And guess who happens to be in the vicinity? Yes, the same old “prophet,” preaching his brand of nudism and Egyptology. Ellery is off and running, chasing his suspect wildly across the country. Unlike The Roman Hat Mystery (1929) and The French Powder Mystery (1930), The Egyptian Cross Mystery has so many elements common to 21st-century crime fiction that it would be a good choice for anyone who hasn’t tasted a Queen mystery before. Those first two mentioned novels, by the way, were the first ones by the writing duo who created Ellery Queen--cousins Frederick Dannay and Manfred B. Lee. And they fell very narrowly into the “locked room” type of mystery, more in the Agatha Christie school than anything else. Some people have called The Egyptian Cross Mystery Queen’s strangest adventure, but it is very much an American novel. The cult, the symbolism of the Egyptian T, a mass murderer, and most certainly the cross-country chase are firmly embedded in the American school of mysteries. Queen still uses logic and clues to solve the case, but there is an action element that is generally not found in British mysteries of the same period, and that is absolutely American. My own novels, set in Dark Ages Britain, are often called both standard mysteries and thrillers. The thriller element involves that danger and suspense of the chase that Queen pioneered in his works. While Edgar Allan Poe is called the Father of the Detective Story, I would suggest that Ellery Queen is the father of the American Mystery. In my book, he certainly deserves the title. (Killer Covers); “An Ellery Queen Bibliography, or, A Challenge to This Reader,” by Puzzle Doctor (In Search of the Classic Mystery Novel). Like you, I never had much luck solving the Queen mysteries. The only one I guessed was THE MURDERER IS A FOX, though my reasoning was completely different from Ellery. That made me wonder if I had just REALLY guessed. It sure is the most lurid of the early Queen novels. And Ellery's lecturing which can get annoying can be forgiven in this one. You need most of it for background. 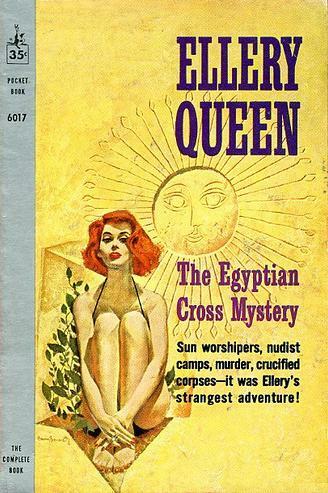 I think THE EGYPTIAN CROSS MYSTERY was the first Ellery Queen novel I ever read. And, I admit it was because of that redhead on the cover. But, once I finished the book, I read about a dozen other Ellery Queens. could u plz send me a pdf or text copy of The Egyptian Cross Mystery. i hav always wanted to read this book, thats y.. I'm sorry, Rodion, but we don't generally send free copies of books to people. 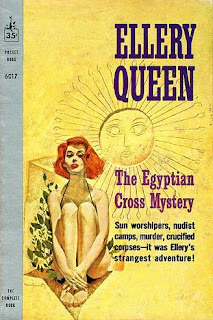 However, I see that there are copies of Ellery Queen's The Egyptian Cross Mystery available from the used-books Web site AbeBooks, http://www.abebooks.com. You can surely find one to your liking there.